Freezing drizzle is causing traffic nightmares across the region. The National Weather Service Winter Weather Advisory remains in effect until Midnight. Lincoln Public Works reports late this afternoon that Twenty City crews continue to apply granular salt, pre-wet with brine to arterial streets as needed. Crews will remain on patrol overnight to monitor street conditions. Arterial streets are generally wet with normal driving conditions, but freezing drizzle is quickly making conditions icy. Use extreme caution especially on untreated streets and sidewalks. Drivers are urged to slow down and increase following and stopping distance. Falling temperatures overnight will cause surface freezing. Please give City crews plenty of room to work. The National Weather Service Winter Weather Advisory is in effect until midnight. Freezing drizzle mixed with snow is possible overnight. Lincoln’s current icy drizzle conditions are contributing to a number of falls around the city. Use extra caution in parking lots and sidewalks. Road conditions continue to deteriorate with a number of accidents reported around the city. 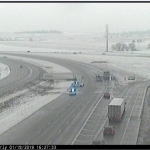 I80 East Bound is reported very slow due to a couple of jackknifed tractor-trailers near the Waverly exit. Temperatures will be dropping as we move to the overnight with wind chills dropping.